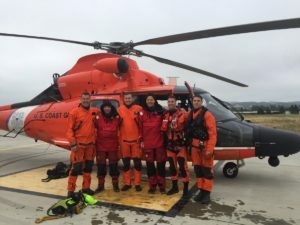 A Coast Guard crew airlifted two sailors who reported they were in distress northwest of Morro Bay on Monday. Due to dangerous conditions, the rescue was not completed until Tuesday morning. At 9:15 p.m. on Monday, the Coast Guard’s Los Angeles-Long Beach command center received a report about a boat in distress about 31 miles northwest of Morro Bay. When a Coast Guard crew arrived, it determined it was too dangerous to tow the distressed boat into the harbor. Coast Guard officials assigned personnel to monitor the status of the vessel until daylight. When the sun rose on Tuesday, a Coast Guard crew flew a MH-65 Dolphin helicopter from a base at Point Mugu to the scene of the rescue. Rescuers hoisted both individuals, and the helicopter transported them to San Luis Obispo Airport, where medical personnel were waiting. A Coast Guard press release says no one suffered injuries, though. The Coast Guard urges sailors to be aware of weather conditions and monitor currents through local television, radio and the internet. Coast Guard officials also urge sailors to wear life jacks while on the water; carry a working marine-brand radio and marine flares; and ensure bilge pumps are operational and vessels are secure for rain and heavy winds.